Gummy smiles are a common problem, caused by overgrowth of the gum tissue that then covers the teeth. This makes gums appear too visible, or simply too big, when smiling. 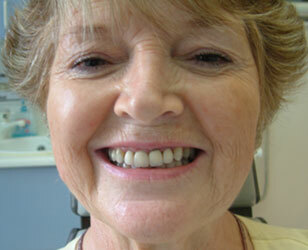 This can cause a smile to look crooked or lop-sided, or make the teeth seem smaller than the gums. Gummy smiles can be easily corrected with a simple procedure known as cosmetic gum lifting or gum contouring. A local anaesthetic is applied to the gums, and a laser is used to trim away the small amounts of excess gum tissue and reshape the edges of the gums above the six front teeth that form the smile. The laser seals the blood vessels in the gums so that the tissue can heal quickly with relatively little discomfort to the patient. Not all dentists specialise in cosmetic dentistry, so it is important to find a dental practice that does a lot of cosmetic dental work including gum contouring. Gum contouring prices start from around £120. 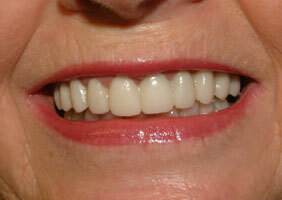 Many patients seeking a cosmetic improvement to their smile have little or nothing wrong with their teeth. Their concerns are their gums appearing too visible, or simply too big, when they smile. "Gummy" smiles are a common problem, caused by overgrowth of the gum tissue that then covers the teeth. This can be caused by a variety of things, including heredity (from your family) health conditions, and even the use of some common high blood pressure medications. These reasons can cause a smile to look crooked or lop-sided, or make the teeth seem almost smaller than the gums. Such problems can be easily corrected with a simple procedure known as a cosmetic gum lifting or contouring. What happens during a Gum Contouring operation? A local anaesthetic is applied to the gums, and a laser (a ray of pure concentrated light) is used to trim away the small amounts of excess gum tissue and reshape the edges of the gums above the six front teeth that form the smile. The laser seals the blood vessels in the gums so that the tissue can heal quickly with relatively little discomfort to the patient. Of course, there are times when reshaping the tissue alone is not enough. In those circumstances the bone at the front of the root of the teeth may have to be reduced. This is done because the gum edges need to be about three millimetres from the edge of the bone. If you don't reduce the bone, the tissue will grow back. This procedure, while more complicated than a simple gum lift, is still relatively comfortable when done properly. What are the risks and potential complications from Gum Contouring surgery? Gum contouring is not without risk, however. If you remove too much gum tissue, then the mouth might never heal properly. It can lead to swelling and a need for further treatment to correct the error. Who can perform Gum Contouring? Not all dentists specialise in cosmetic dentistry, so it is important to find a dental practice that does a lot of cosmetic dental work. What is the average cost of Gum Contouring? Gum contouring prices start from around £120. "Gummy" smiles are a common problem, caused by overgrowth of the gum tissue that then covers the teeth. 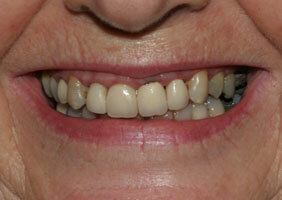 This can cause a smile to look crooked or lop-sided, or make the teeth seem almost smaller than the gums. Such problems can be easily corrected with a simple procedure known as a cosmetic gum lifting or contouring. Patient's old crowns were showing at the gums. She also had a gummy smile. 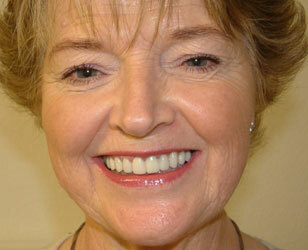 The dentist replaced her crowns with porcelain (metal free) restorations. He also used a laser to re-contour her gum line. The arrangement of the teeth was altered slightly to complement her face. Photographs courtesy of Dental Surgeon Dr Haider Raza LDS, RCS, BDS at Thurloe Street Dental.